I'm trying to find a way of collecting SQL server query response times over say for the last two days. Is there a way to achieve this? I know there are the query stats DMV's but I dont seem to be achieving what I required. I dont have access to query store therefore unable to use that at the moment either. I'm looking for query response time from SQL server as I have people blaming the sql server but I can't see no memory pressure / cpu pressure or any bottlenecks. Therefore now trying to get the response times for queries ran against the server. There are indeed multiple methods. Once it is turned on, you can look at query performance details. Gotchas: Fair warning - turning on Query Store will clear the plan cache! 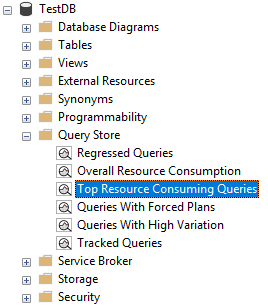 Query Store, as a newer feature, can have some quirks. I've run across several myself. As far as performance, I see it used in environments with 20k batches/sec and only a couple of percent CPU overhead. Another option is to use the dmvs. The one you are looking for in this case is sys.dm_exec_query_stats, specifically the "elapsed_time" columns. Here's a query to look at recent long-duration queries. Gotchas to be mindful of with this dmv are that it doesn't capture RECOMPILE queries, and it doesn't capture canceled queries (which is what happens with a query timeout from the application). 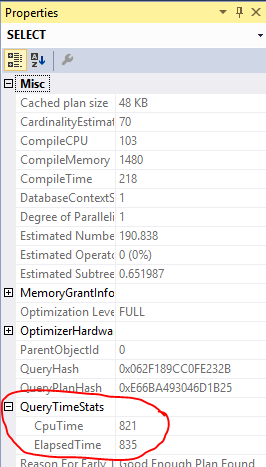 Finally, if you know the exact query, you can run it in SSMS and look at the actual execution plan. Highlight the select, and look at the properties window on the right. You'll see extremely helpful information about CPU and duration (in milliseconds). Similar information exists for the operators as well. Gotchas with this method include the fact that queries submitted through SSMS do not necessarily reflect what happens with application queries. Canonical link here. In short, I highly recommend Query Store. In addition to great tips above I might suggest to check on light weight extended events. Depending upon the storage available and no of events being captured you can get the required data with some minimal performance impact. Elapsed time in SSMS is consistently higher than SQL Server Execution Time - connection issue?